Add a unique feeding station to your backyard with the Heath Stack'ms Seed Cake Feeder with Roof. The wide base, tall center shaft, and dramatic roof on this piece create a new look in your yard, while its all steel body ensures durability. A vertical rod in the center of the piece holds up to four Heath Stack'ms Seed Cakes (not included), and its open design allows bird to dine on all sides of the item. The generous, 6.25" diameter base forms a secure platform for the cakes, and its elevated and flared ring provides birds with perching spots. The 6.25" diameter roof protects the feed from rain and sun, and a steel ring here makes hanging the item simple. Unscrew this roof from the shaft to refill the feeder as needed. Use four of the same Stack'ms cakes to feed a specific type of bird, or use different flavors to invite a wider variety of birds to dine. 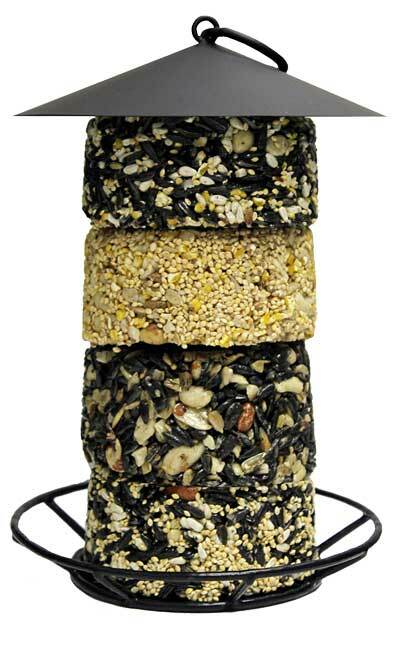 Offer birds a new and dynamic feeding area with this Stack'ms Seed Cake Feeder with Roof. Note: This description refers only to the Heath Stack'ms Seed Cake Feeder with Roof. The seed cakes shown are not included.